Home » Honey , Unique Ingredients » Chestnuts! 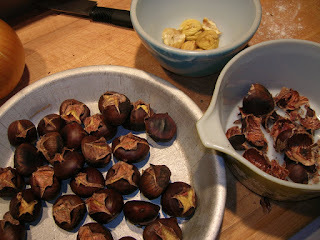 The chestnuts themselves were great - easy to peel, sweet, and slightly smoky. The smoke nuances came from the fact that I rarely crank my oven up to 475, and that incinerated all the little bits of pie filling that dripped down to the oven floor earlier this week. For the glaze, I just mixed 1/4 honey with a tablespoon of water, some cracked black pepper, microwaved it for 30 seconds, then added 1 tsp cornstarch, microwaved for another 30 seconds, and out came the oddest looking jelly. I was surprised just how quickly and thickly the cornstarch would work in a microwave, but it resulted in a very easy glaze. 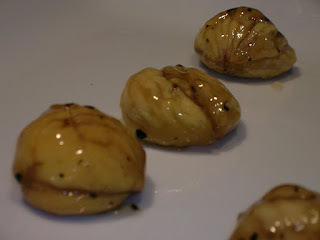 They tasted good, more sweet with just a little heat, but perfect as an hors d'oeuvre. I'm not sure if I would repeat the recipe, as it didn't really make the chestnut flavor "pop" like I thought it would. A glaze of walnut oil, brown sugar and fennel pollen might be more what I'm looking for. Fun recipe to try, though! As for the rest, they're all going in a Spinach Risotto with Abbamele. Abbamele is a fun Sardinian product, basically reduced honey and pollen. Imagine an olive oil press filled with honey combs, which are pressed to draw out the honey and pollen. Then cook it all down to reduce the honey to an even thicker syrup. It's a great sweet condiment when you want to play off savory notes in a dish. Ok, back to peeling chestnuts.